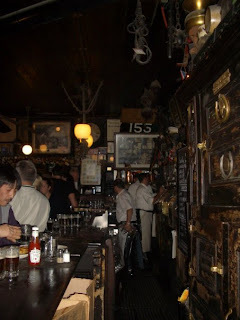 Ahhh, McSorley's. 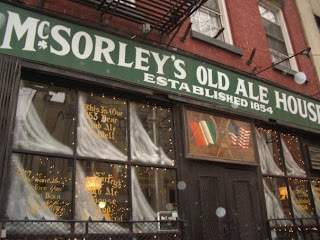 A favorite of locals and tourists alike, McSorley's is a must-see simply for its 155-year history, making it the oldest operating bar in town. This was of course on our to-do list while in the city, especially it was a perfect way to spend a rainy afternoon. Cramming into this saloon just off the Village is no easy feat in the evenings, on weekends, or during the holiday season. But regardless, we have made it a tradition to make our way over there for at least a beer or two whenever we are in town. This time was no exception - at 4pm on a rainy Saturday, it was packed out, but the patrons are always willing to squeeze someone else up to the bar, and trust me, its worth it! They offer two beer selections - Light and Dark. If you don't like beer, sorry, wrong place for you! 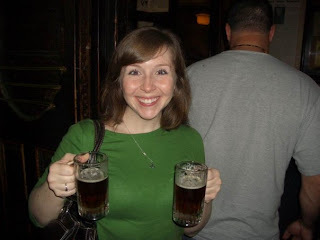 One beer is actually two smaller mugs, and they serve them up all looped onto one hand. A no-frills, cash-only menu offers up some pub fare, including one of the most popular snacks, the cheese, onion and crackers plate. The bartenders (many of whom are directly from Ireland) are quick at grabbing new beers for you, and then hauling off all the old glasses at once, sometimes 10 on one hand! Sawdust covers the floor, and countless frames and documents cover the walls, some as old as the place itself.